In an issue of Genome Biology in January 2018, Van Baak and colleagues analyzed the epigenome of monozygotic versus dizygotic twins. 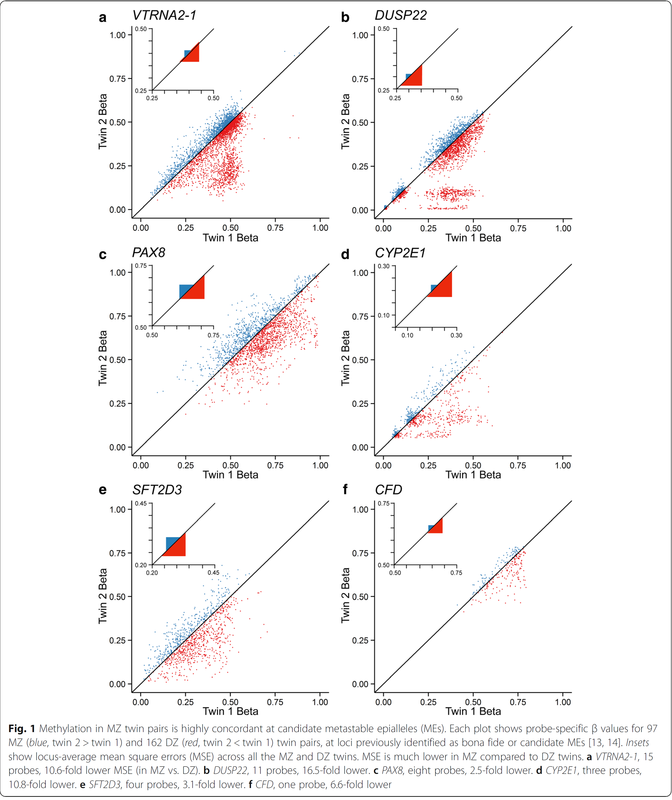 As you can see from the figure which was copied from the OpenAccess journal, dizygotic twins expose divergent methylation patterns in several genes (in red). Most remarkably is this for the DUSP22 gene which codes for a “dual specificity phosphatase”. On the other hand, monozygotic twins (in blue) showed almost no divergence, methylation rate ratio were very close to one, which would be on the diagonal line. This lead van Baak et el. to look for the origin of this invariable methylation between two individuals. They found this supersimilarity between pairs of monozygotic twins is established at or before the stage when the twins become twins. This was fairly unexpected. During their search the authors noted that subtelomeric regions are not only important targets for methylations, but at the origin of diseases e.g. tumour later in life. Since the paper is very technical, it is difficult to read. The fact that monozygotic twins are not only identical in the genome, but extremely similar in their epigenome, too, is worth some labour with the text. Major depression (MD) is an understated disease. It is present in any culture and worldwide. I saw with regard to this a research highlight in Genome Medicine by M.Rivera and P. McGuffin, who commented on the succes of a whole consortium whose members did a tremendous search for genes linked to Major Depression and found them. I then went to the paper itself in Nature which is prepared and written by the Coverge Consortium from China, Oxford and VCU in Richmond, VA. Some 5300 people with the disease were sequenced and compared to some 5300 healthy controls. The researcher were pointed to two genes which were analyzed in detail and variants thereof proved to dispose for MD. These are SNPs close to the Sirtuin 1 and the LHPP genes both on chromosome 10. SIRT1 is a stress-response and chromatin-silencing factor. It is an NAD(+)-dependent histone deacetylase involved in various nuclear events such as transcription, DNA replication, and DNA repair (citation from OMIN 604479). LHPP is the phospholysine phosphohistidine inorganic pyrophosphate phosphatase. This gene has already been implicated in MD: http://www.nature.com/mp/journal/v14/n6/full/mp20088a.html. This is an intriguing story for those involved in the science of MD, but also for the persons concerned. If there is a gene or some gene responsible, one is not to blame personally. This is a good finding. South Americans – only one wave of settlers? Nature reports: The meeting of the Society of American Archeology listened to Dr. Fehren-Schmitz, who presented the sequencing of human bone found in Peru at a site called Lauricocha. The remnants are from five individuals, two of them died around 9000 years ago, a third 2.500 years later and another a further 2300 years later, the fifth was dated. The sequences were derived from mitochondria and from the Y chromosome. The GnRH neurons are unique among the hypothalamic neurons that they originate not in hypothalamus itself, but in the vomeronasal organ of the olfactory bulb and move (in the mouse) between day 10 and 17 of embryonic development into the hypothalamus via the forebrain. When this wandering is impaired, there is not any GnRH synthesis in the hypothalamus due to missing GnRH neurons, a phenomen called Kallmann syndrome, and subsequently the patient undergo hypogonadotrophic hypogonadism. In a report in Molecular Endocrinology this week Gabriel Di Sante and colleagues from Philadelphia with the help of Canadian coworkers from Ottawa describe in mice another protein involved in this wandering of neurons. They found that the Sirt1 protein is necessary to start the migration of GnRH neurons. Sirt1 is the analogue of sirtuin protein originally found in yeast as Silent regulatory protein and has diverse physiological functions. Sirt1 defective mutants are not viable and die in utero. The paper shows that the migration is initiated intracellularly due to the interaction of FGF8 and the FGF receptor, Sirt1, and corstatin, whereupon the sirtuin protein leaves the nucleus and deacylates the cytoplasmatically located corstatin. This interaction then makes the neuron migrate. There are other mechanisms listed in the introduction of the article which effect the migration. But none is as near to the origin of the migration as this one. A nice piece of work! Recommended! Mitochondrial DNA (mtDNA) is used to assign traits in human evolution: for example it was claimed that the Ur-mother of modern humans lived in Africa. mtDNA may harbor fatal mutations which cannot be treated. If there occurs a mutation during the life of an individual this mutation is rarely fatal since it is well diluted. However, if a women during oogenesis transfers these mutation to the oocyte, the problem is multiplied since there are only some mtDNA molecules transferred and therefore one mutation might result in diseases like diabetes, cancer, male infertility, Parkinson, or Alzheimer. The male mtDNA does not reach the progeny. In an article in PNAS Rebolledo-Jaramillo and colleagues have analyzed in detail mutation rates, disease accumulation and dependency of the age of the mother on the frequency of mutations in the child. They show that on average 9 mtDNA molecules are transferred to the oocyte. The mutation rate is 1.3 × 108 /year (10 times higher than for genomic DNA) which means a mutation in about every 78 th mitochondium (mitochondium has 16.5 kB). They found also, and that is easily comprehensible, that the older the mother the higher the risk of a defect mitochondrium for the child. Ten years older means a tenfold higher risk. This risk is independent of fathers since only the maternal mtDNA is inherited. There might be other risks due to age in man but they have to be analysed. Nice and careful article! Recommended! The Mayo Clinic must be really desparate. Otherwise the news about a partnerships of her and the IBM and its Watson supercomputer is not understandable. Forbes reports about this new cooperation. Or the article is a mess: At the origin is the search for an effective search for patients. That the doctor needs an hour to read the study protocol is very optimistic. Normally it is presented at a meeting which takes one or two days. Then there is the issue of informed consent which should be individualized and performed not by medical staff but by a doctor involved and listed in the study. That alone should take more than 30 min, otherwise it is not thoroughfull and complete. You see that streamlining the selection process will not save very much time for the doctor. Not in the way the Mayo clinic hopes. The historic origin of Europeans is obviously much more complex than initially thought. Sciene reports from a meeting of biomolecular archaeology: Johannes Krause (Tübingen University, Germany) presented data that the European history started as late as there was migration from Africa: some 60000 years ago. These people were not the first settlers in Europe. They met the Neanderthals. And they were gatherers and hunters. These hunters eventually were invaded 9000 years ago by farmers from the Middle East. Note the farmers invaded the hunters/gatherers and not vice versa. To the great surprise of scientist involved there is a third source of DNA of Eurasian origin which was found in Scandinavia and Letonia, but not in the South of Europe. This “ghost” DNA was then found in boy from Sibiria who died some 24000 years ago. You will not find a person with the same genome today, but part of it is present in North America and in Europe. The picture is a crude scheme of this development. We were told that an article will appear soon and we will tell you about. There is a fascinating article in BMC Biology (doi:10.1186/s12915-014-0066-4, Open Source)which deals with bacterial evolution. It is an eye-opener for people not involved into the subject. Bacterial evolution is so fast via horizontal gene transfer (HGT) that there is almost no time for “normal” base exchange mechanisms. The predominant way of evolution is by gene loss, but occasionally via gene gain which may change the bacteria dramatically. This has also an impact of the charactization of bacteria whose genome should be regarded as part of a pangenome or even supergenome. I wonder whether a given size (which is obviously maintained) would limited horizontal transfer of larger parts of the genome. factors the exact nature of which remains to be elucidated. The analysis of genome dynamics allowed us to estimate the size of microbial supergenomes which in the majority of the analyzed microbial groups turned out to be large but closed, exceeding the characteristic genome size by about an order of magnitude, but for a minority of microbes were appeared to be open. The analysis of tumour remains fascinating. While e.g. viruses, methylation of DNA, gene silencing, mutations and deletions have been recognized for some time to play major roles in tumour development, a new player has emerged only recently: microRNA or miRNA. An Open Access review in Current Biology ( http://dx.doi.org/10.1016/j.cub.2014.06.043) features this new class of molecules and describes how they act on tumours. A must read! A nice analysis of the trimethylation of histon 3 at lysine 4 (H3K4me3) appears in Cell this week (http://dx.doi.org/10.1016/j.cell.2014.06.027). Benayoun and Pollina et al. claim that this marker labels preferentially those proteins that are essential for the cell’s function. The marker has been found at the start of most transcribed genes, but Benayoun and Pollina argue that not its mere presence, but the intensity of its presence is a sign that this protein is relevant for lineage specifity. If this intensity is disturbed, that function is not maintained. This is a metaanalysis of a very broad range including human, mammalian, protostomes, plants and fungi. Nicely done!